That was an interesting read. Perhaps not as funny as I had expected, but interesting nonetheless. Basing his argument on what he calls the ‘Hotdog Incident’, where he had to wait for 1 hour to get served a hotdog, and was rudely treated when he dared complain, Danny Wallace goes to explore rudeness and rude behaviours in general. Why are people rude? What’s in it for them? Why are the usual reactions to rudeness, and what do they reveal about people in general? 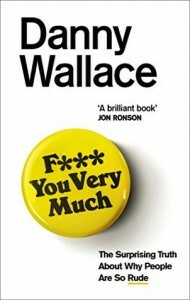 According to Wallace, it seems that there is something in it for rude people. Rudeness and bullying often tend to create a cognitive dissonance in people who’re at the other end of it, making them slower to react to it; so it looks like this explains why we keep wondering why rude people ‘get away with it’, when it’d stand to logics that they should be pointed at and shamed for their behaviour. I bet most of us had at least one experience of that kind (not necessarily about an actual hotdog) where hours later, we were still thinking about what we should’ve said or done instead. Why didn’t we do it for starters? Because of the shock of being treated rudely. I don’t know if the science behind this is really exact, however, I’m willing to agree with that out of empirical evidence, so to speak. There were moments when I thought, ‘Did he really dwell on that Hotdog Incident for so long, isn’t that a little far-fetched?’, and it felt more like an artificial gimmick than an actual example to write a book about. But then, I guess it also ties with the point the author was making: what seems like little incidents can indeed stay with us for a lot longer than the few minutes or even seconds they took to happen. And I do agree that rudeness is contagious. It’s happened to me quite a few times. If someone bumps into me in the street and doesn’t apologise, I’m much more likely to stop caring about the people around me: ‘If -they- don’t make way for me, why should -I- make way for them?’ So, it’s a vicious circle. Being aware of it helps, of course, because then it’s easier to act upon it. Still, it’s frightening how being rude can come… naturally. A few parts are also devoted to exploring cultural differences, such as what is considered rude in one country but not in the other. Some of those I already knew about (the ‘Paris Syndrome’), others I discovered through this book. This, too, was interesting, because it puts things back into perspective. That’s not to say that we can afford to be rude because we can ‘make it pass as if it’s normal somewhere else’, of course.